Does your child act a little wild sometimes? Well, that's natural! Kids have boundless energy and their imagination can take them to all sorts of wondrous places! It's hard to blame them for scampering through the house, howling like an animal. Of course, even a wild child can enjoy the pleasures of modern day comfort! Just take these Wolf Paw Slippers for kids for instance. These fluffy slippers are designed for kids with those chaotic kids who still need a cozy way to keep their feet warm! 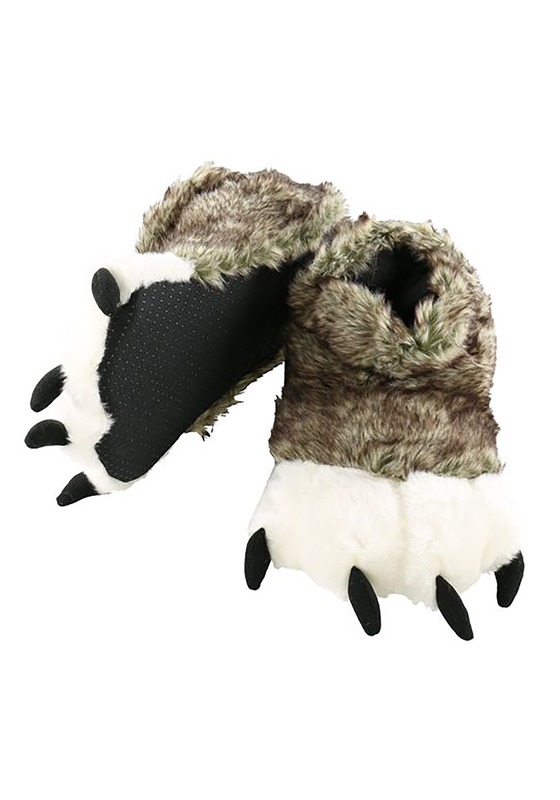 Made from a blend of acrylic and polyester, these slippers look like wolf paws. They have a thick layer of faux fur on the exterior, which means they'll keep your child's feet extra warm, even when they're tromping through the house like a wolf puppy. The bottoms of the slippers feature no-slip grips on the bottom to help while using them on sheen surfaces, like wood, linoleum, tile. Care is easy, since you can wash them in warm water and tumble dry them! If you have a bit of a wild child on your hands, then these Wolf Paw Slippers may just be the perfect indoor footwear for your little one!